The Supply of a drug specified in Schedule H1 shall be recorded in a separate register at the time of the supply giving the name and address of the prescriber, the name of the patient, the name of the drug and the quantity supplied and such record shall be maintained for three years and be open for inspection. If it contains a drug substance specified in Schedule H1, the drug formulation shall be labelled with the symbol Rx which shall be in Red and conspicuously displayed on the left top corner of the label and shall also be labelled with the following word in a box with red border as mentioned below in warning section. 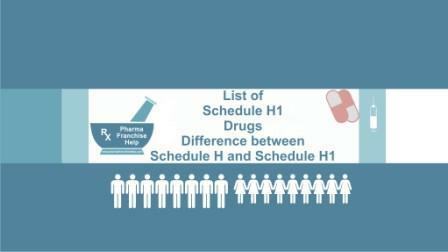 There is not any major difference between schedule H and schedule H1 drugs but antibiotics, anti-TB drugs and habit forming that were fall under schedule H category was moved to a new sub category that is known as Schedule H1. Schedule H and H1, both categories shall be sold under prescription of a Registered Medical Practitioner only but norm regarding drug fall under Schedule H1 are strict. A proper record of every sale, purchase, prescription copy, patient detail, doctor details under which prescription drugs are sold out etc. shall be maintained for at least three years for schedule H1 drugs where there is no requirement for maintaining record for drug which fall under schedule H drugs. Why there is need of Schedule H1? In recent time, number of cases of antibiotic resistance diseases are increasing. One of the main cause of antibiotic resistance is easy availability and self medication. There was urgent requirement of implementation of any strict laws that Schedule H was not available to implement. Where infrastructure at ground level is of third class. Even in some area there is a lot of Medical Store running without a License or registered pharmacist. One another major problem in Indian Pharmaceutical supply system is that there is a much more chance of drugs without any invoice from its sources i.e. manufactures. In some states where there is tendency and demand of drugs without proper billing. The main reason of this practice is difficulty of getting a particular drug license for retail shop and different tax role at different states. Our drug department also plays a major role in promoting this practices. Corruption is key of this bad practice of pharmaceutical sector. RMP in India have a strong hold particularly in rural area and in areas where there is no medical facilities. For cheap and easy medicine they are beneficial but our country does not have sufficient amount of doctors to feed the requirement of increasing population. So these so called RMP’s is now necessity of some areas in India. These are the person even does not know the definition of antibiotics and recommend stronger to stronger antibiotic for minor illnesses. Adulterated and inferior quality medicines come in market due to not having proper drug distribution system. Secondly we haven’t any system which can distinguish between generic and branded products. On other hand our Drug control system having such drawbacks that anyone can easily escape from it. Political power and Mafia interference also effect the system. In recent years Indian Drug department making a policies to make it at international level but we think there is lot of improvement is required at zero level to make policies effective.Without these we can’t establish a USA type drug delivery system in India. Medicine should be considered life saving not just like a Karyana Store where any one can demand and get. Is it necessary to take cheque from chemist for payment against schedule H1 drugs or we can take cash also, as some of chemist neither wants to fix stamp on bill nor give payment by cheque. Payment collection should be in proper manner. Either Cheque or Cash payment receipt. You have to show proper billing and record of all schedule H1 drugs. You have to make sure that in any case chemist don’t refuse to present your bill in front of drug officer. Chemist who don’t want to fix stamp or give payment by cheque don’t want to manage stock of schedule H1 drugs. You have to careful in this matter. In future Schedule H1 is going to be implemented very strictly. Thanks for explaining Sch H1 drugs in easiest way. Thanks for finally writing about >"List of Schedule H1 Drugs. Difference between Schedule H and Schedule H1" <Loved it! WHEN THE SCHEDULE H1 WAS INTRODUSEC IN INDIA?